With a half century of music, over sixty studio albums (thirteen going gold), three Grammys, and a flurry of Top 10 R&B and Top 40 hits to their name, Motown’s premiere vocal male group, for lack of better words, keeps on truckin’. Although all but one from the classic lineup have died, the mighty Temps are still churning out music. 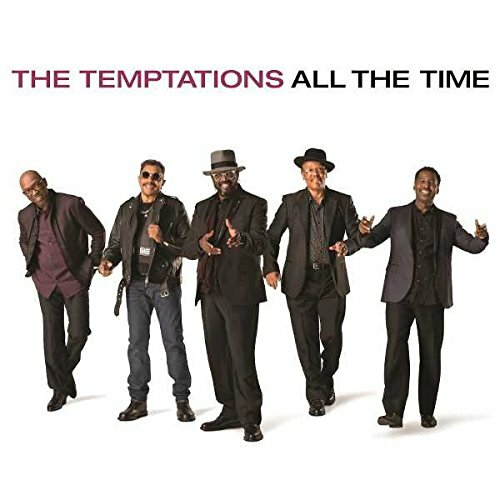 The current version of the Tempts, with Otis Williams still in the rotation, includes longtime members Ron Tyson and Terry Weeks, along with newcomers Larry Braggs, now filling in as first lead, and bassist Willie Green. It’s been eight years since their last studio album, Still Here, dropped. But prior to that were two cover sets, Back to Front and Reflections, albeit the latter focused on Motown classics. With All the Time, the Temps’ sixty-second album, they’ve corralled together a list of mostly 21st century pop songs, supplying them with a live R&B studio feel while incorporating their legendary five-part harmony as much as possible. Most responsible for the sound heard here is album producer Dave Darling, whose credits range from Glen Campbell to Def Leppard. Except for a few dabbles in blues such as his work on the Grammy-nominated Love Wins Again by Janiva Magness, he’s hardly done any real work in R&B. So touching the Tempts, particularly on an assignment with this amount of pressure, seems intimidating. Darling tries to keep things in bounds by allowing the songs to soar like refreshing updates. And it works in theory and on select numbers. Maxwell’s “Pretty Wings” traces the original, but is modestly updated with the group’s vocal backings. Then their doo-wop swoops inhabit the atmosphere of Ed Sheeran’s “Thinking Out Loud,” a song that already inhabits Motown genes for its resemblance to Marvin Gaye’s “Let’s Get It On.” Sam Smith’s “Stay with Me” is a smart choice, as it glides into gospel territory, thanks to falsetto work from Ron Tyson and soulful ad-libs on delectable repeats of its chorus. John Mayer’s glistening 2017 breakup jam “Still Feel Like Your Man” — a song already blessed with Motown vibes, Isley Brothers swag and laidback Robin Thicke traits — feels at home on the Tempts’ soul. Of the originals, “Waitin’ on You” works the best. It is slick, blessed with contemporary swag and sounds like it could squeeze between Jaheim and vintage Maxwell. “Be My Wife” gets a pass for being abundantly rich with urban AC appeal, even if it tends to demand more during its performance. Regardless of what version we tend to encounter, what we really expect from the Temps manages to show up on All the Time: the smooth, five-part harmonies; a call of duty to Motown allegiance; shareable lead parts. But the toughest gripe about this set is that even the world’s famous vocal group can’t save every song. That may have worked in the past, but with a sound that is distinguishably classic, it’s not always enough when attempting to save lukewarm compositions and lazy productions in today’s musical climate. And as good as Larry Braggs croons and belts, you often pause and wonder what things would sound like if Dennis Edwards, Ali-Ollie Woodson or the imperative David Ruffin, especially at their peak, would’ve sounded like on some of these offerings. Still, the Tempts, even in their covers phase, are still a mesmeric force to hear, and try their best with what they’re allotted. Modestly recommended.